Only the ALL AMERICAN Pressure Canner features an exclusive, precision machined “metal-to-metal” sealing system. These Pressure Canners for canning feature positive action clamping locks that align the cover to the base, forming a steam-tight seal. Since the seal does not use a gasket, the cover can be easily opened and closed. The ALL AMERICAN Canner makes it easy to can fish, meat, vegetables and fruits – it’s the only method the USDA recommends for low-acid foods. All canning pressure cooker models feature a precision machined regulator weight for accurate pressure control and an easy-to-read, 8.5 x 5.5″ Instruction and Recipe Book. Suitable for gas, electric, or flat top stoves. 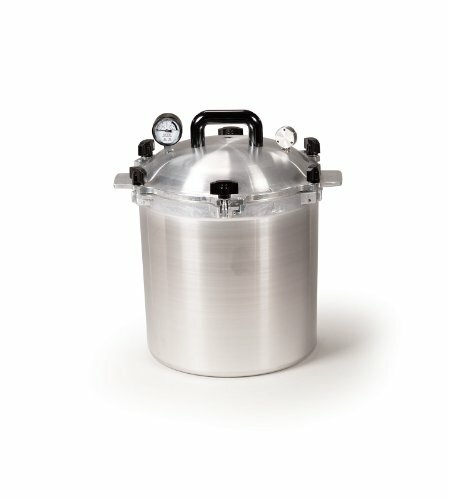 The high heat generated by a pressure cooker can kill more bacteria than a regular hot water bath, making this pressure cooker the ideal tool for canning vegetables and non-acid fruit. The metal-to-metal seal permits venting under unusual pressure conditions, making the seal safer than conventional rubber or composition gasket cookers. Crafted of the finest hand-cast aluminum, this durable cooker/canner features a stay-cool Bakelite top handle, geared steam gauge, automatic overpressure release and pressure regulator weight with settings of 5 PSI, 10 PSI and 15 PSI. The attractive satin finish is smooth and easy to clean. Double thick edges provide added protection at the points of heaviest wear.